According to report at <www.eluniversal.com>, a new flag will be hoisted on 28 March 2006. The new flag is reported as black-red-yellow. There is no confirmation from another source and the official site <www.miranda.gov.ve> still show the flag as above. Generalissimo Francisco de Miranda: illustrious Venezuelan Hero and Precursory of Latin American independence whose memory has received tribute two hundred years after his liberating expedition in which, by the way, was affirmed the Prioritized Flag of Venezuela (horizontal tricolor yellow, blue and red) in the leader ship "Leander" on March 12th, 1806, in Jacmel Bay, Haiti, already on the eve of taking coursec to Venezuelan coasts at which he arrived following August 3rd. This commemoration has given rise to symbollogical changes signed by the "rapidity" with which it has taken place, leaving in doubt its legitimacy and therefore its transcendence. All began on last March 9th with the official publication of the new Law where one eighth star was added to National flag and modified substantially the Coat of Arms of the Republic, which it's also described like "Bolivarian". - Historical Synthesis: It was approved as a part of the Constitution of Bolivarian State of Miranda on July 25th, 2006 and enthroned by Governor Diosdado Cabello on next August 12th. Its necessary to mention that the initial proposal included three stars oriented upwards and three downwards disposed in angle on the red stripe. Sources: Web Site Gobernment of Miranda State, Diario El Universal (Daily El Universal) Diario Tras la Noticia  (Daily Following News) August 2006. Here is image of the flag as it appears at the official site <www.miranda.gov.ve>. The Mirandian Coat of Arms consists in a Germanic shape filleted in Or and divided per bend; this is, with two diagonal quarters. The Sinister Quarter of the Chief enameled in Or (yellow) shows a sailboat sailing on a quiet sea accompanied by a curiara (typical aboriginal boat) guided by two indians. The Dexter Quarter of the Base enameled in Argent shows a natural landscape with a river in the middle of a forest with cattle and the silhouette of mountains. Over all, a Bend (heraldic piece which consist in specie of stripe diagonally disposed from the Dexter Chief to the Sinister Base) enameled in Gules (red) charges a five-pointed star in Argent (white) on the Dexter Canton of the Chief. As External Ornaments, the blazon presents two cornucopias in Gules upsetting its fruits as crest and as supports, branches of coffee and cacao to the dexter and another of sugar cane at the sinister jointed by means of a pennant enameled in Sable (black), Gules (RED) and Or (yellow) charging as mottoes the following ephemeris 5 DE JULIO DE 1811 (July 5th,1811); 1° de FEBRERO DE 1817 (February 1st ,1817) and 3 DE AGOSTO DE 1806 (August 3rd , 1806). - Semiology: The First Quarter alludes to the commerce whilst the curiara and its conducers represent Cacique (Indian Chief) Guaicaipuro and his warriors. The Second Quarter reminds two landmarks of the regional geography: the Tuy River and the Coaster Ridge symbolizing, besides, the agriculture and the wealth of the ground. The Bend represents the Hope and the Star symbolizes the Peace. The Cornucopias reminds the Abundance. 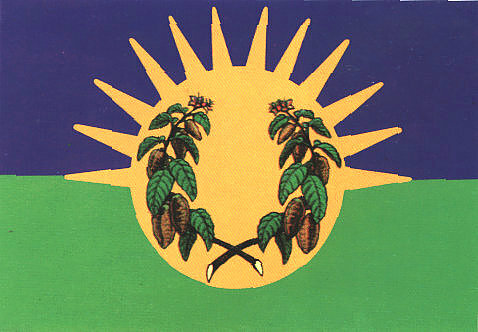 The Coffee, Cocoa and Sugar Cane branches rebounds the main agricultural products of the region. The ephemeris reminds respectively the date when was signed the Act of Independence of Venezuela; the date when was born General Ezequiel Zamora, Hero of Venezuelan Federal War and the date when Generalissimo Francisco de Miranda arrives to Vela de Coro. - Historical Synthesis. 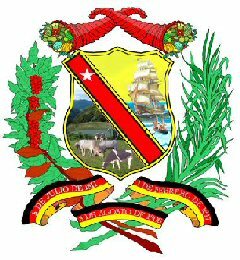 It was approved as a part of the Constitution of Bolivarian State of Miranda on July 25th, 2006. Sources: Web Site Gobernment of Miranda State.